Last week I went into a Honey Baked Ham local store armed with a free coupon for a sandwich. I decided to splurge on my free lunch and get a side. They have the most amazing “fruit salad” I’ve ever had. They call it Mandarin Pineapple Dream which is a very fitting name. As I ate it I began dissecting it. It’s very simple to make yourself and much cheaper than to buy from them at $5.99 a pint. I love that it takes no baking, or cooking and can be put together ahead of time. This is perfect for a lighter dessert. 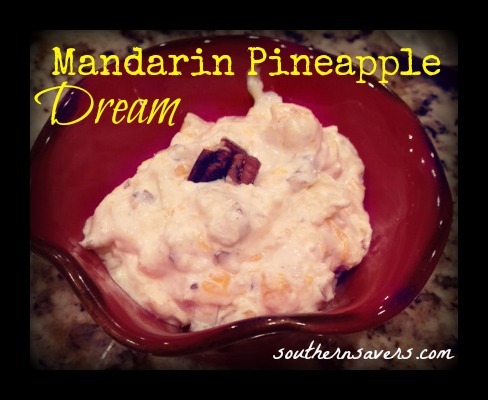 A copy cat recipe to the amazing Mandarin Pineapple Dream you can get at Honey Baked Ham Company. Super Easy and incredibly delicious. Drain all fruit in the same colander, leave in the colander and mash with potato masher (or just wash the bottom of an empty can and use that) to push out extra fluid and break up mandarin slices slightly. 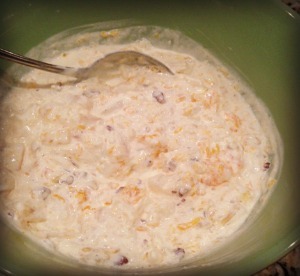 Put fruit and all other ingredients into a bowl. Mix together. And eat! If you don't have crushed pineapple, just mash harder or use a quick pulse of a food processor on any other type you do have. If you want to reduce calories you can do half low fat Cool Whip and half regular. It doesn't turn out that great to use all low fat though.